Roam free, my friends. All photos by Marianna Jamadi. 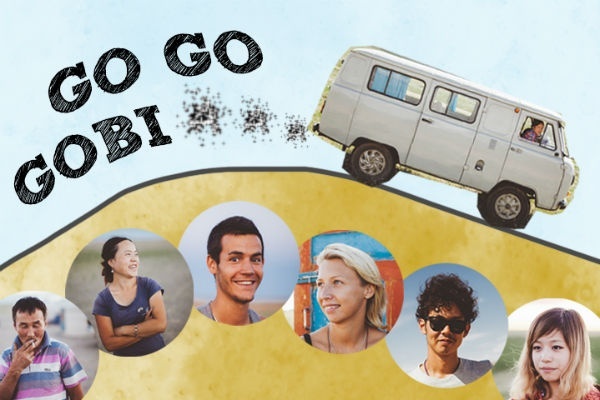 Last time we heard from globe-trecker Marianna Jamadi, she had just finished the first leg of her 547-day dream trip around the world. 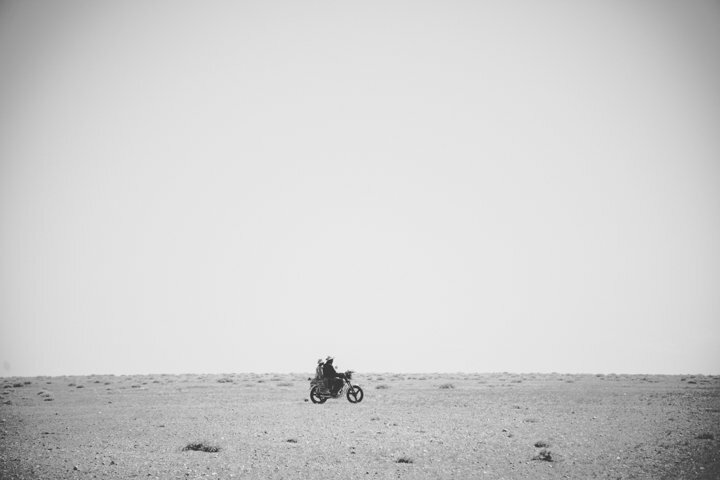 She checked in with us again at the halfway mark in the Gobi Desert. There may not be any beds, hotels, real roads, or indoor bathrooms, but it feels like luxury experiencing that expansive sky. 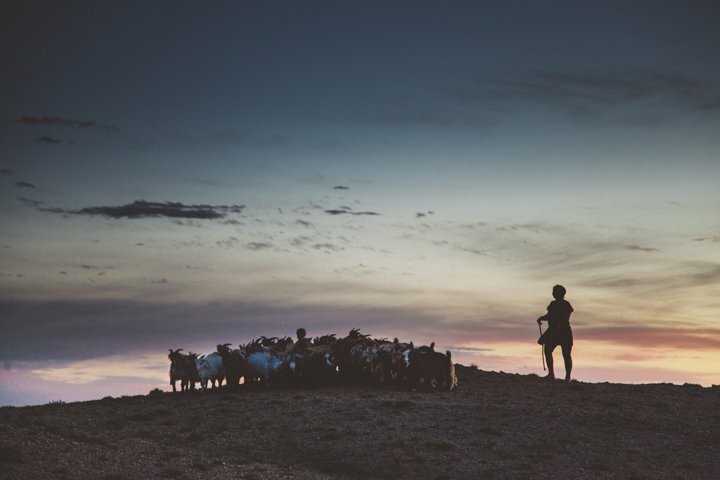 GOBI DESERT, Mongolia – Mongolians have a true nomadic habit. 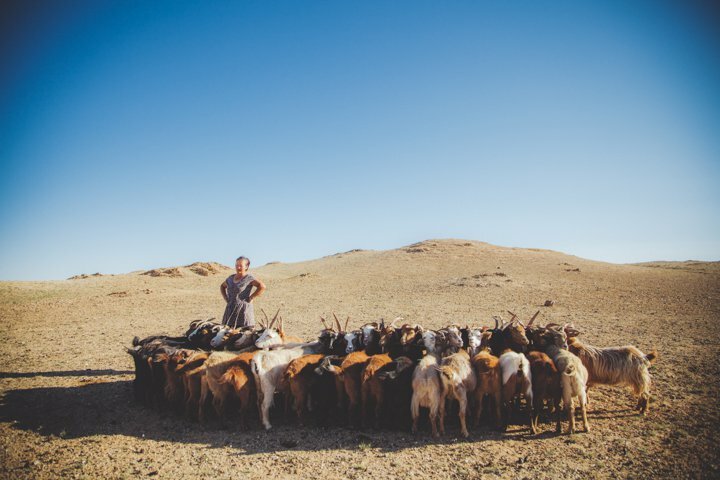 We got a taste of this on our eight-day tour through the Gobi Desert. 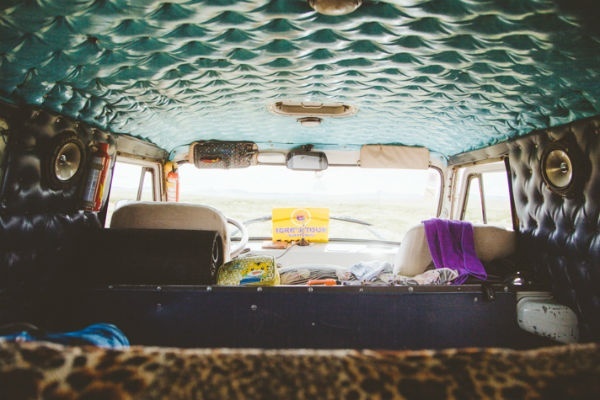 Remember our lovely van ride from Olkhon? In terms of bumpy roads, this was Olkhon times eight. Guess we had good practice. Our group consisted of a driver, a guide, an Austrian couple, and two folks from Japan. We all got to experience the "roads" as we bumped around this Russian van (and boy do we know Russian vans) together for a week. So what does this tour consist of? A hell of a lot of driving. I'd say we were in the van driving, or getting thrown around the van, for, on average, six hours a day. 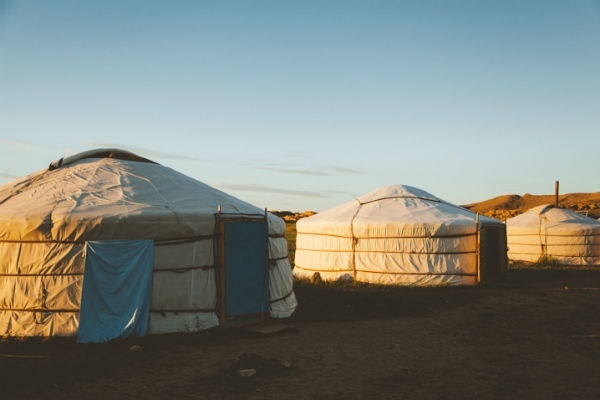 Each night we would stay with a nomadic family that had an empty ger (yurt) that could accommodate our group. You'd think these sort of accommodations would be arranged beforehand, but it was very off the cuff. Some families we stopped at already had guests, so we would often have to visit several families until we found an opening. The gers were basic, and when I say basic, I mean you are sleeping on a wood board with a thin padding. Pillows were improvised by wrapping our jackets in our towels, and sometimes Rick and I or the Austrian couple would have to share a twin bed. Remember my gripe about two twin beds pushed together? Well now we were either in two separate twin beds or squished together in one. Dare I say I was wishing for the twin beds pushed together scenario. All in all, nomadic luxury. Now let's talk about bathroom facilities. Or let's talk about how there aren't any bathroom facilities. These nomadic families had outhouses that made you wish you were constipated so you didn't have to use them. So then what? Why be stuck in a smelly outhouse when you can squat somewhere tucked away in the hills and watch camels in the distance? We skipped the outhouses and became expert squatters (I knew those yoga classes I took before the trip would come in handy). I am pretty sure I could go to the bathroom in Warrior Two pose if I had to. Needless to say, toilet paper and wet wipes were always stuffed in our pockets. Wet wipes were also the closet thing we had to a daily shower. 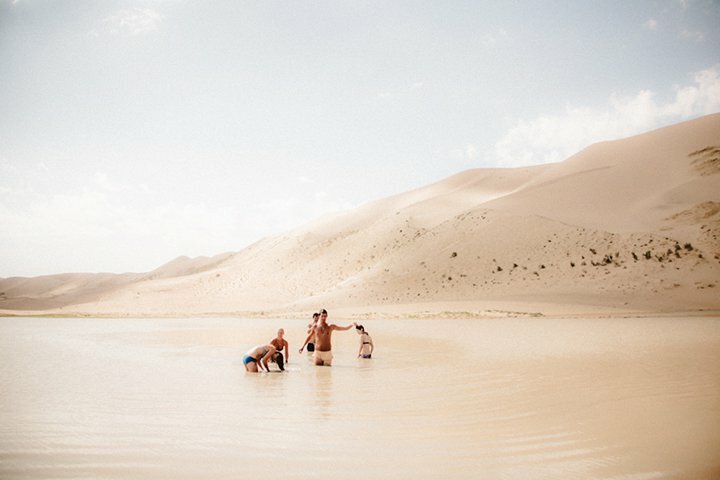 We had one true shower the entire trip and two improvised bathing sessions in a body of water in the Gobi. Desperate times call for desperate baths. No bodily rashes were discovered. You are probably thinking, all of this sounds awful! Nausea-inducing bumpy roads, a toilet-less trip, bathing next to camel feces, no showers in sight, and beds that leave you stiff as a board. Why on earth would you even want to partake, let alone pay for such an tour? Let's get to the good stuff. 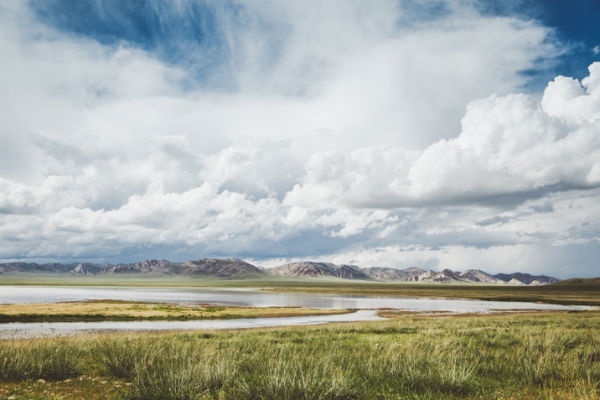 As Mongolia's landscape revealed itself, I didn't know if I should cry out of bliss or pee my pants out of excitement. Luckily, I saved myself the embarrassment of both, but no doubt Mongolia has a way of moving you. It's like seeing for the first time. 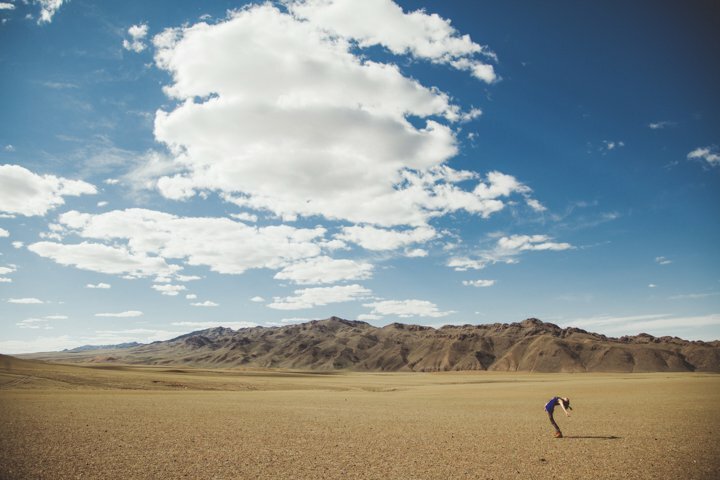 My virgin eyes were deflowered by Mongolia's curves. It was the seduction of simplicity. It has a way of making you feel small, yet possible. Much in the same way you might feel when you're in a plane and you look down at earth and realize you are an ant in comparison, only to realize your ant-sized self is hurling itself through the sky to discover the world. That is possibility. That is living big. 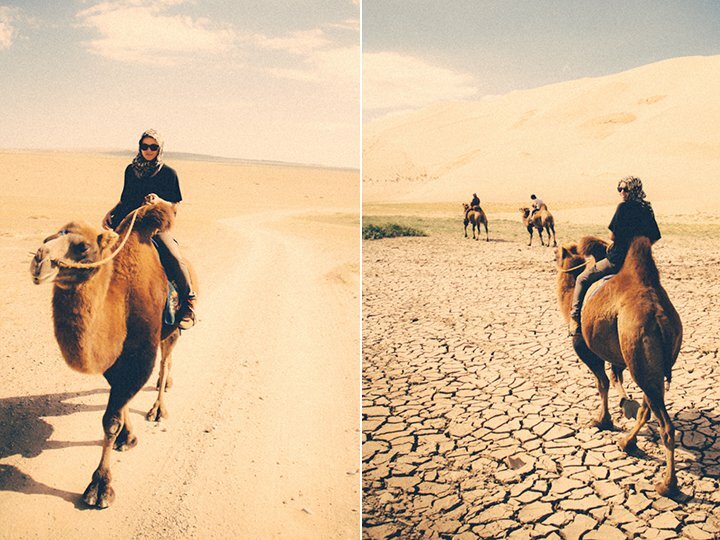 Check out the insanely gorgeous photos from the rest of Marianna's Gobi Desert Tour. Keep up with Marianna and her boyfriend through their blog, Nomadic Habit. 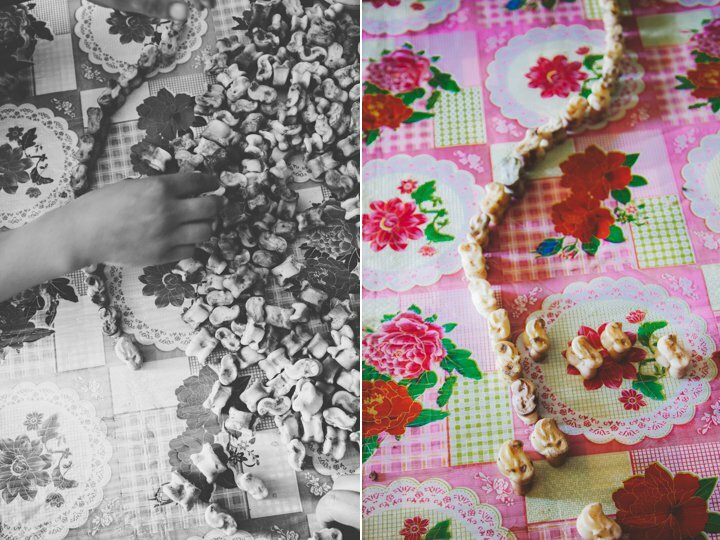 Besides all the great photos, you can also buy handmade goods from Marianna's online shop. 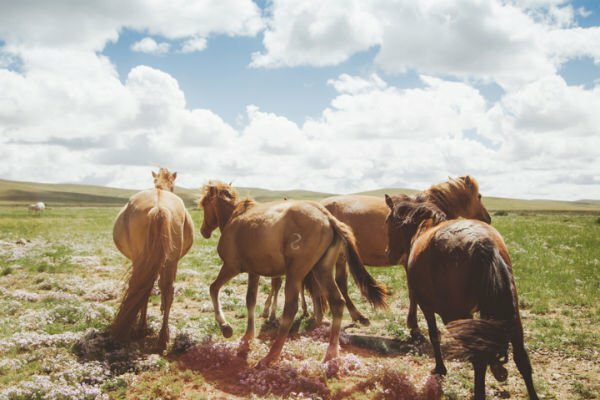 This story originally appeared on Marianna Jamadi's blog, Nomadic Habit, and is reprinted with permission. We finally arrive at Tsagaan Suvarga, also known as Painted Desert. We start at the bottom and drive perilously to the top where the view is nothing but spectacular. The desert floor looks like it had a field day with red and orange splatter paint. We get back in the van and find our home for the evening. We say hello to the family, which consists of a grandmother and her grandchild. We try dried goat curd. They corrall the livestock and Rick finds his Capricorn self. 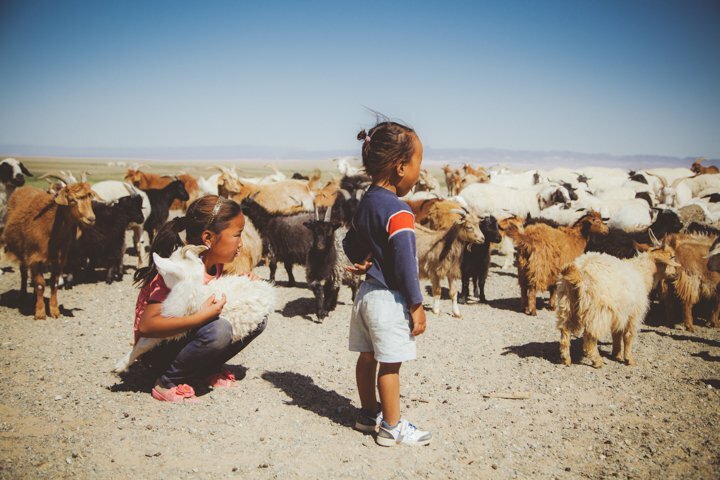 Day 3 starts off as any normal nomadic day does — milking goats. I’m not so good at it. 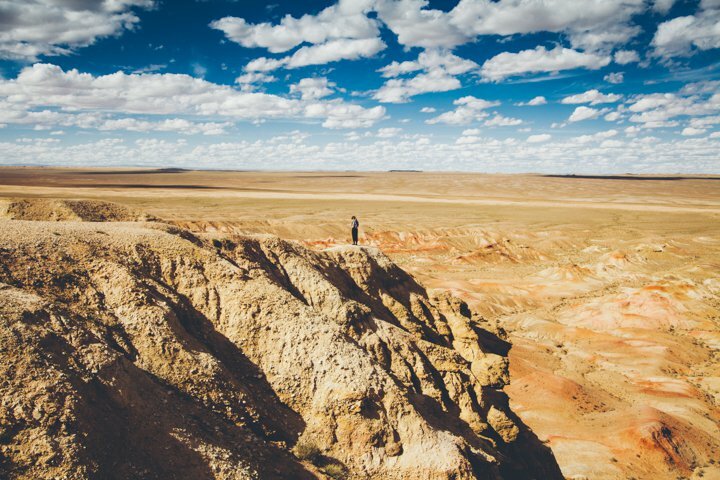 The Gobi is a hot spot for dinosaur fossils. If I was a dinosaur, I’d definitively live here. We leave the area we deem The Land Before Time and travel into a protected area only accessible by way of tour operators. 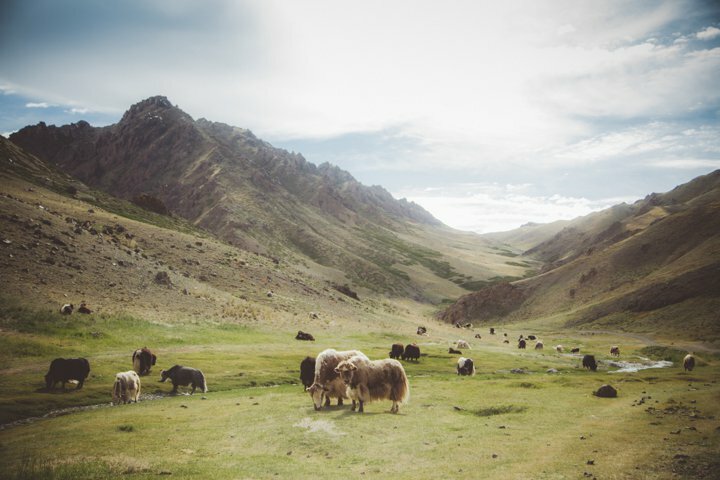 It's all narrow gorges, yaks, and impressive views. My Gobi Desert camel-riding fantasy is realized! By day five, we were all dying for any form of a shower. We all put on our bathing suit attire at a chance of feeling fresh. I even make an impromptu facial scrub out of Gobi sand and sunscreen. Who needs a spa? Our guide and driver set up a game played with livestock ankle bones. I never thought I’d see the day where I’m rolling ankle bones like dice. Vegas is missing out. 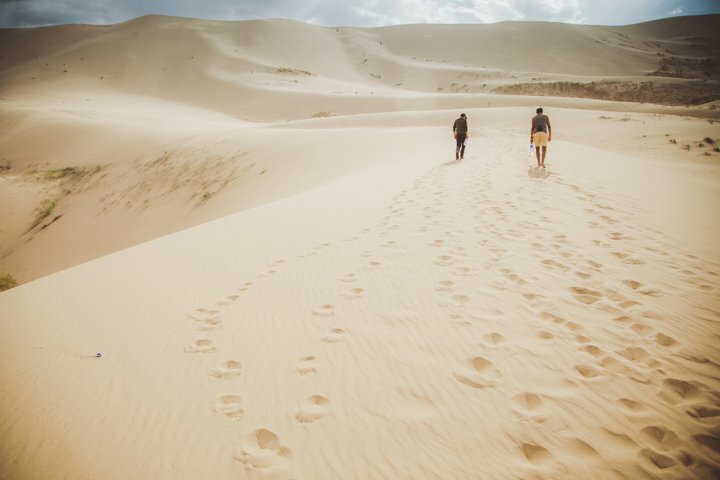 The dunes are steep and the sand is slippery. It is like being on the StairMaster for an hour. Thighs are burning! 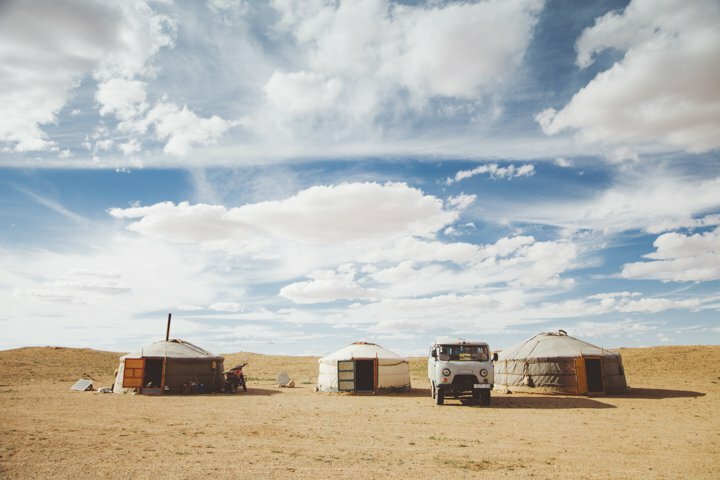 After leaving the lovely dunes of the Gobi, we quickly stop because our engine is overheating. Just love these Russian vans. We stop where a nomadic family has set up tables of different souvenirs for purchase. While some are tending to the tables, others are tending to the livestock. Here the goats go wild for water. Day 7 is all driving, minus a lunch stop. We arrive back in Ulaanbaatar the next evening.